Donald Trump said women giving birth in their "ninth month" of pregnancy is "wrong". 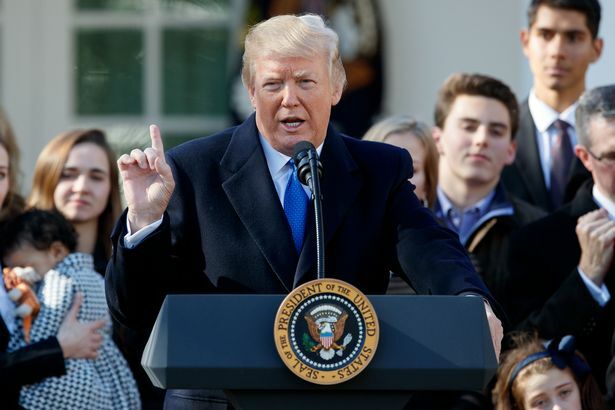 The US president made the perplexing statement during a March for Life anti-abortion rally on Friday. During his speech, Trump said: "Right now, in a number of states, the laws allow a baby to be born from his or her mother's womb in the ninth month. It is wrong, it has to change." It is likely Trump was trying to criticise abortions initiated in the third trimester. But the bizarre statement has left people scratching their heads. The Republican president's speech, relayed via video link from the White House Rose Garden to thousands gathered on Washington's National Mall, highlighted his shift in recent years from a supporter of women's access to abortion to a powerful opponent. This month marks one year since Donald Trump banned the US government from giving funding to health groups that offer abortion counselling. According to Planned Parenthood, less than 1.4 percent of all abortions take place after 21 weeks. Most occur because of medical complications, financial restrictions, and lack of access to or knowledge about pregnancy and abortion during early stages. In January 2017, the president signed an order reinstating the "global gag rule", which denies US foreign aid to groups who "perform or actively promote" terminations. He was photographed signing the bill in the Oval Office, flanked by eight members of his staff, all of whom are men. Speaking at the rally on Friday, Trump said: "Today tens of thousands of families, students and patriots, and really just great citizens, gather here in our nation's capital. "You come from many backgrounds, many places, but you all come from one beautiful cause: to build a society where a life is celebrated, protected and cherished. "The March for Life is a movement born out of love. You love your families, you love your neighbors, you love our nation and you love every child born and unborn; because you believe that every life is sacred, that every child is a precious gift from God." "Under my administration, we will always defend the very first right in the Declaration of Independence, and that is the right to life," he continued. "Today, I am announcing that we have just issued a new proposal to protect consciences, rights and religious freedoms of doctors, nurses and other medical professionals. So important. "I have also just reversed the previous administration's policy that restricted states efforts to direct Medicaid funding away from abortion facilities that violate the law. The March for Life is an annual rally protesting both the practice and legality of abortion, always held in Washington DC on or around the anniversary of Roe v. Wade, a landmark decision which was issued in 1974 by the United States Supreme court decriminalising aboriton. The march, whose stated mission is "to provide all Americans with a place to testify to the beauty of life and the dignity of each human person", advocates for overturning of Roe v. Wade. It is organised by the March for Life Education and Defense Fund.